Don't let your kids have all the fun! 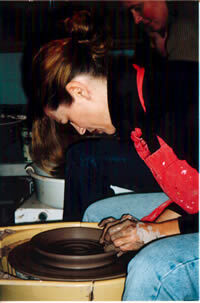 Register now for classes in Drawing & Painting or Ceramics & Pottery Wheel with our visiting professional artists. Whether you're a beginner or a more advanced student, we focus on the individual skills and techniques needed to fully realize your own artistic potential. Adult classes have a slightly different structure than classes for kids. Class size is limited to 3 to 8 people, and materials are not included in the cost, since many adult students already have the tools and materials required. From Fall to Spring (September to mid-June), we offer ongoing, 2-hour classes in 9-week sessions. Classes are available mornings or evenings and are held in the Atelier studio at 14 Kings Road in Madison. For directions, see Contact Us. During the Summer (late June to late August), classes may vary. Please call our Office at 908.604.0773 or e-mail us at admin@creativehandsartstudio.com and we'll notify you when the next one is scheduled. Please call the office at 908.604.0773 for class info.